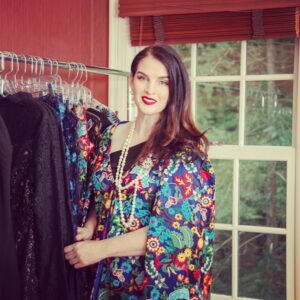 Katherine Mahony designs, manufactures and sells women’s ready to wear clothing. She has over fifteen years of experience in the Fashion, Television and Film industries, and is originally from the United Kingdom. Katherine opened up a styling business catering to women’s wardrobe needs soon after moving to the U.S in 2001. Her business helped women develop everyday looks, perform wardrobe overhauls, and dress for cocktail and black tie events. She started working her way into Print, Television and Film, where she managed wardrobe, production design, and talent on many successful projects. In 2012 she moved to Shanghai where she soon discovered that the expatriate community did not have access to clothing that suited their unique needs. She worked closely with mostly international clients to design clothing that used flattering materials for comfort, shape – and style. One of her most popular designs was a take on the classic Qipao – instead of using pure silk, she designed it with a heavy spandex cotton material, using rushing, to flatter the female form. Her latest designs are all women’s outerwear made with Tweed, Wool, Lace and Jacquard, hand stitched blends, many of which she showcased at New York Fashion Week 2017. Her inspiration comes from living in five countries on four continents, from England, France, Africa, and Asia to the USA. Katherine has been featured in British Vogue. Please send me a note and I’ll get back to you right away.